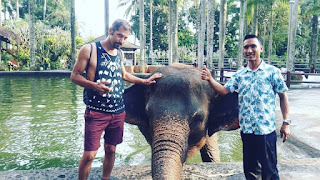 First visit on Bali Water Sports and Uluwatu Tour is the water sports parks for do Water Sport Activity package such as : Flying Fish, Banana Boat, Glass Bottom Boat and Turtle Islands Tour. Perhaps all of us love the adventure of water, here you can do water activities that have been provided and do not doubt they've experienced so all you get a warranty. 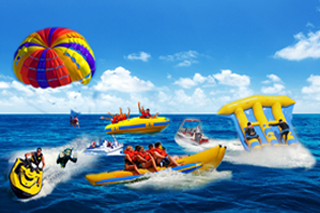 Enjoy Bali Water Sports adventure for your enjoyment. Bali Water Activity giving the fantastic experience marine adventures for everyone. Padang Padang Beach also known as Labuan Sait beach, due the location of the beach is in Labuan Sait Street, pecatu village. Is the famous beach with the white sand along the beach and good wave for surfing and swimming. the unique of this beach is we had to descend the stairs are made in the cliffs. After a few yards down the stairs we are greeted by the sun. It turns a dark alley behind the beach there is incredible beauty. The waves that roll, rock-breaking waves, and the sky is captivating. Uluwatu Temple was built by Empu Kuturan in 9th AD, was build on a 70-meter-high cliff protruding above Indonesian Ocean. 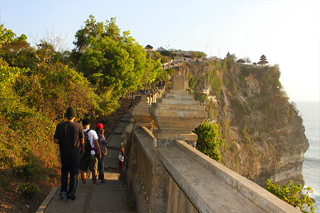 Because of its unique location, visitors to the temple have to take a long stone stairway to reach it. The temple function as a sea temple, which protecting the islands from bad influence and near the temple live thousand monkey which local people believe if the monkey was guarding the temple from negative things. Uluwatu temple always become the most favorite temple for visit. Kecak and fire dance always perform in the evening, due the dance also perform fire dance which look very good in evening time. The story takes from popular Hindu epic of Ramayana. 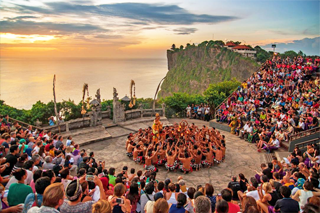 The dance perform in open air near Uluwatu temple, is perfect place for enjoy three things, dance, sunset and temple. The dance was perform in large group of dancer which make unique sounds "cak" and perform very well by Balinese dancer which put some humor in the dance and will make you more enjoyable to watch.